Pinay In Texas Cooking Corner: My 1st Blogging Award!!! If you haven't visited her blog, be sure to check it out! She has a wide variety of recipes that you'll surely love. My favorite is her Bacalaitos (Codfish Fritters)...I'm sure you'll love it too! 1. Make a post about the award, thank the person/s who gave the award and put a link back to the person/s site. 1. I'm originally from the Philippines so I'm a Filipina (Pinay). It was in Nov. 2004 when I relocated here in Texas with my husband and eldest daughter. 2. I have a Christmas birthday…quite hated it when I was a kid for the main reason that I never got the chance to enjoy having separate Christmas and birthday gifts. 4. Perfume is one thing I can’t live without! Lacoste Pour Femme, Estee Lauder’s Pleasures and D&G Light Blue are among my faves. 5.I have RH- blood type and I'm among those 3% of the general population who have mitral valve prolapse. 6.I love cooking and I enjoy trying new recipes. Japanese food is my second favorite next to Filipino food! How I wish I can go to Japan for a taste of authentic Japanese food! 7. I've worked for 7 years...but it’s in the past 6 years of being a full-time mom that I experienced the greatest fulfillment in my life. Professional success – I admit I like it - but the fulfillment in knowing that I've been able to watch & guide my girls well during their growing up years is something no professional success could match! congrats and keep cooking and sharing. Soon many will be aware of your great food blog. Congrats on your award, you totally deserve it! And Thank You so much for passing it on! I feel honored that you thought of me! again, thank you thank you !!!! 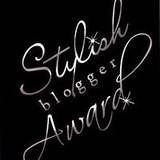 Thanks for the stylish blogger award and thinking of me!!! Keep up the great work!!! Enjoy your blog!! Thanks for sharing!! !